As we approach the 30th anniversary of Roe v. Wade, it's crucial to look back to the time when abortion was illegal. 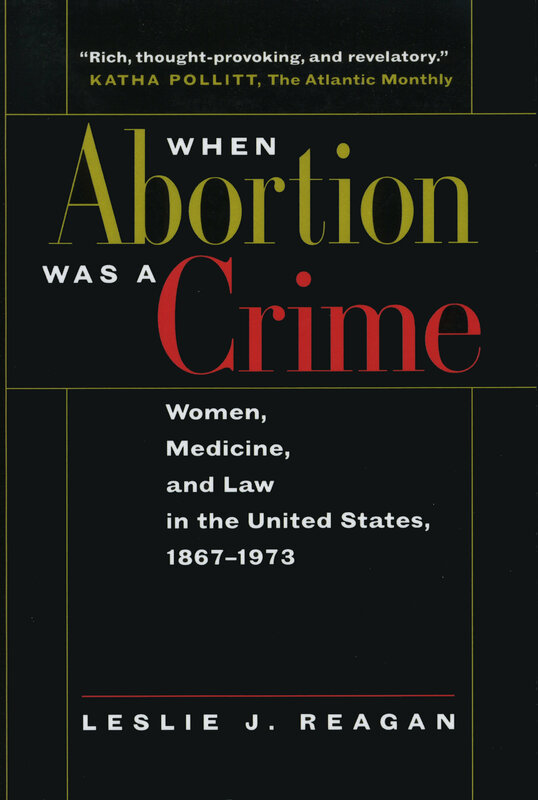 Leslie Reagan traces the practice and policing of abortion, which although illegal was nonetheless widely available, but always with threats for both doctor and patient. In a time when many young women don't even know that there was a period when abortion was a crime, this work offers chilling and vital lessons of importance to everyone. 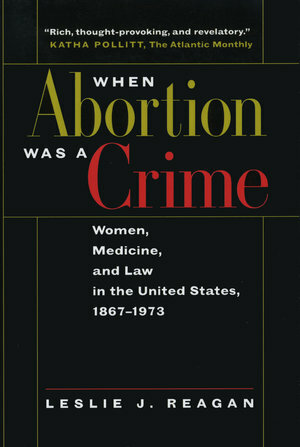 The linking of the words "abortion" and "crime" emphasizes the difficult and painful history that is the focus of Leslie J. Reagan's important book. Her study is the first to examine the entire period during which abortion was illegal in the United States, beginning in the mid-nineteenth century and ending with Roe v. Wade in 1973. Although illegal, millions of abortions were provided during these years to women of every class, race, and marital status. The experiences and perspectives of these women, as well as their physicians and midwives, are movingly portrayed here. Reagan traces the practice and policing of abortion. While abortions have been typically portrayed as grim "back alley" operations, she finds that abortion providers often practiced openly and safely. Moreover, numerous physicians performed abortions, despite prohibitions by the state and the American Medical Association. Women often found cooperative practioners, but prosecution, public humiliation, loss of privacy, and inferior medical care were a constant threat. Reagan's analysis of previously untapped sources, including inquest records and trial transcripts, shows the fragility of patient rights and raises provocative questions about the relationship between medicine and law. With the right to abortion again under attack in the United States, this book offers vital lessons for every American concerned with health care, civil liberties, and personal and sexual freedom. Leslie J. Reagan is Professor of History, with affiliations in gender and women's studies, law, media and cinema studies, and medicine, at the University of Illinois, Urbana-Champaign. She is the author of Dangerous Pregnancies: Mothers, Disabilities, and Abortion in Modern America (UC Press) and coeditor of Medicine's Moving Pictures: Medicine, Health, and Bodies in American Film and Television.